An electronic balance isn't a terribly smart idea. But as has been said, this is probably a staged demo. Would be at some event. Note the award in his hands and smile on his face. Probably around 2010 when he licensed his IP to Boeing via a deal arranged between the US and UK governments. Looks like 3650.3 MHz, 3KHz fm at a 1K rate. 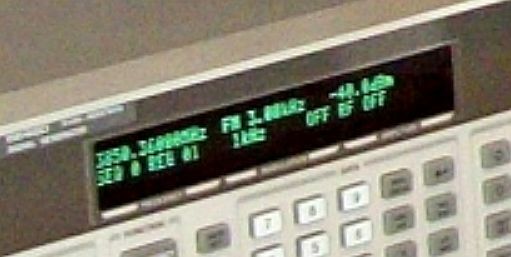 But the generators RF out is " off"
Display layout attached. Cleaned up the display best I could. It may be that if the Rf output amplifier is disabled (as it is), the freq & modulation / deviation circuits still work and display what is on the output but now input coax. Which would make sense as the Rf is being fed into the Flight Thruster vis the bottom red coax, from the TWTA switched output. All good info for me as I can now set 3.85GHz as a reference frequency and play with the 3 Flight Thruster dimensions to be optimal at 3.85GHz. So one variable MAYBE known. From that can calc the height to get resonance between the curved end plates. Then 2 variables are locked down. That will leave only the big and small end plate dimensions to work on to get best Df at 3.85GHz. Would suspect the movable small end plate disc was very near or at the right end of the cylinder as in the drawing. Shawyer said his video camera had sync issues because of the high E field the EM Drive generates. Said the rotary demo generated the equivalent of a 17MW E field being the Rf input energy times the cavity Q. 378W Rf * Q of 45,000 = 17MWs. That is why I'm building an external Faraday Cage around my Flight Thruster replication and around the Rf amp. Not so much to protect against being microwave cooked but against interference with my data collection and logging system. So an EM drive is basically a magnetron that shoots out microwaves? Possibly useful since it doesn't need fuel, but I just wonder what kind of power is required. Any expectations yet? I'd like to see how this would eventually compare with the ion drive. That would be it's first competitor. No microwaves leave the Em Drive, other than small unintentional leakage. 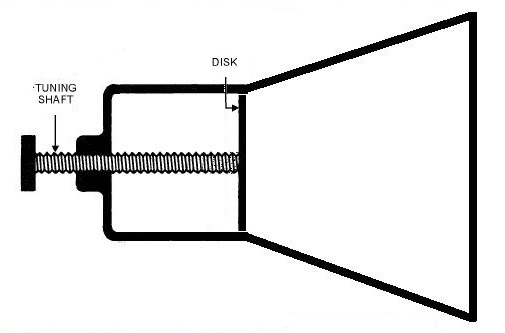 Thrust is produced INSIDE the sealed cavity. The setup (magnetron and frusum) was suspended in a pendulum. I applied power for 40 Seconds with no visible thrust. Tomorrow will will try again with the magnetron on the small side. You have any suggestion for what should be the distance from the small side? After this i will adjust the power to the filament of magnetron and the frequency. To fine adjust the frequency i thought i can put 2 coils over the magnetron magnets to modify the magnetic field. Have you tried to calibrate your pendulum test rig by using a small spring scale to see how much force is needed to pull the cavity forward (toward the big end) say 1mm? Doing this will give you some info on how much force you will need to generate to see some movement. a hanging swing pendulum like that has, for small deviations, a linear dependency between force (thrust) F and displacement d F=(m*g/h)*d where h is length of strings and m the mass of test article and g local gravity. As a first guess, with m=2kg (or more like 5kg ?) and h=2m that's in the ballpark of 10mN/mm (milliNewton per millimetre) or 10µN/µm. Quite remarkably similar to Eagleworks balance apparent stiffness, making this mechanical setup basically as sensitive (displacement wrt thrust wise). If a linear displacement sensor of µm resolution were used it could probe into µN effects, provided proper casing to isolate from drafts and good damping where strings are suspended. - weight of system 2kg, more ? - height of doorway, or rather length of strings about 2m ? - graduations marks spacing about 1cm ? The graduations marks on the video appear about 1cm apart, there is no obvious swing or displacement at power-on visible above, roughly eyeballing 1mm. That gives an upper order of magnitude bound for a thrust (if any) below 10mN/kW for this blazing fast experiment setup. Kudos, and stay safe. Would suggest 1gf / 10mN would be a really good result from this setup. Based on his published frustum height dimension of 228.6mm, Rf cavity resonance is 1.311GHz or 2.622GHz, which is a bit high for his magnetron. 244.7mm will give resonance at 2.45GHz. Assuming there are no fudge factors to be applied to parallel plate microwave resonance. I think Shawyer is weighing it, which may be a better setup because the results can be easily quantified. 10 mN would affect its weight measurably, and if a balance were used, the accuracy could be very high. The weight of my setup is 5.9Kg and the height is 1.9 meters. Notice that there is a singularity at 1.21136 GHz such that Shawyer's Design Factor doesn't have a Real value for frequencies below it. Also notice the rise and steepening of the Design Factor curve as the cut-off frequency is approached. QUESTION: If Shawyer thinks that his Design Factor steepening behavior near the cut-off frequency associated with the small diameter is correct, why didn't he test his Flight Thruster at a lower frequency, closer to 1.2 GHz instead of the higher frequency he chose of 3.782 GHz? Doesn't Shawyer want to maximize thrust force ? 3D Plot of Shawyer's Design Factor vs. frequency and vs. small diameter; for same big diameter as Flight Thruster, but with the small diameter ranging from zero to same size as big diameter. Remember: according to Shawyer the Design Factor multiplies the Power Input and the Q. The higher the Design Factor, the higher the thrust of the EM Drive, the smaller the Design Factor, the smaller the thrust. Observe that at high frequency, the Design Factor changes almost linearly with small diameter, such that the Design Factor goes to zero as the small diameter approaches the big diameter. The Design Factor approaches 1 for the small diameter approaching zero. As the small diameter approaches zero, the cut-off frequency clips the Design Factor, such that to be able to have a smaller small diameter one has to operate at higher frequency (in order to avoid cut-off). A very nice feature of Shawyer's Design Factor (as opposed to McCulloch's formula) is that Shawyer's Design Factor incorporates the cut-off frequency and hence it prevents consideration of a pointy cone, as the cut-off prevents too small of a small diameter to be considered. Observe that for sD -> 0 (for the small diameter approaching zero, a pointy cone), the cut-Off frequency for the small end goes to Infinity, hence according to Shawyer's Design Factor the EM Drive cannot have a pointy cone. It must be truncated. Whether Shawyer's Design Factor is correct, remains to be proven. For example, Shawyer's Design Factor predicts that the smaller the small diameter the better (hence larger cone angles, for constant frustum length), in contrast with Todd's conjecture that the highest attenuation the better (which leads to small cone angles ~7.5 degrees as the optimal design). ... linear dependency between force (thrust) F and displacement d F=(m*g/h)*d where h is length of strings and m the mass of test article and g local gravity. So the apparent stiffness is more like 30mN/mm : 3 grams force for 1mm visible deviation. If the cavity were experiencing thrust/power ratio similar to some of Shawyer or Yang et al this would be visible though (almost a cm at the Chinese record 288mN/kW). The power cord setup is far from ideal, maybe you could lead it along one of the suspending wire, starting from the top fixation points, with as thin/supple as possible wires. Also it should be possible to record displacements down to 1/10mm (3mN = .3gf) with a thin needle flying close above millimetre graph paper and filming closer, in macro mode or through magnifying lens ? Point a fixed laser to a small slit on the device. Place a target on the other side of the room. The diffraction pattern should change with microscopic variations of position. EDIT: the slit should probably be slightly tilted so the distance between the target and the slit changes with position. Do people in this thread even realize that this would boil down to a contradiction with radiation pressure measurements dating back over 100 years? Do you "even realize" that people in this thread already realized this, and this is addressed earlier in this thread, in a much more comprehensive and technical manner? There are numerous posts, where Shawyer's formulation is criticized point by point, not just historically, but on a scientific basis. The point of displaying Shawyer's Design Factor is not an endorsement of his formulation, but it is a scientific/technical way to further understand and comment on what it implies, to be able to compare it with experimental data and with physical laws. Physics for hundreds of years has been a science whose language is mathematics instead of words. How else is one going to be able to adequately assess Shawyer's formulation (or any other formulation) unless his mathematical equations are displayed, and analyzed? I have read the draft and although I can't vouch for the maths (my skills are way below what is required - as soon as tensors are involved I have to give up) the concepts do make sense to me. This is most definitely interesting and it would be a great result if we could measure this gravitational effect with an interferometer setup. I have a question: if there is a gravitational effect in the cavity, how is this effect distributed? Is it symmetric? And what is the entity of it, quantitatively? I am reasoning that if there is an asymmetry in the gravitational effect and the cavity is filled with a perfect gas (or even just air), then in principle there will be a pressure gradient within the cavity causing a (very small?) average density gradient. However, if this density gradient is immersed in a gravity field (like Earth's) the apparatus will weigh more on one side than the other. This will generate a (very very small?) torque trying to twist the apparatus until the gradient aligns with the gravity field. Reading the history of the SPR Flight Thruster, it was a design/build project for Boeing. I suspect the 3.85GHz dual redundant variable Rf source and 300W TWTA are from some space rated project and Boeing wanted the Flight Thruster to be driven from it? If so, the Flight Thruster may have been a design constrained by the clients selection of the input frequency and maybe max dimensions and mass? Very interesting plot. Was working Excel to do the same, but why reinvent the wheel? Nice data. One element we have yet to nut out is external applied Rf cavity resonance between the 2 end plates. Is vital for this to happen, as without resonance to applied Rf frequency, there will be no thrust developed as Q will be very low. Simple to calc wavelength 1/2 wavelength between and call it done but with constantly variable guide wavelength between the end plates, my gut says end plate resonance is not 1/2 of Lambda0 (free) as Lambda0 only exists outside the cavity, nor Lambda1 (big end) guide wavelength nor Lambda2 (small end) guide wavelength. Additionally guide wavelength varies continuously, at each point of diameter change, from one end of the cavity to the other. So how to calc the external Rf frequency required to bring the cavity into end plate to end plate resonance and allow Q to grow very large? Of course all this assumes any external waveguide / coax is tuned (SWR 1:1) to supply Rf energy with minimal loss. It is important as Shawyer says in the 1st attachment. In the 2nd attachment there is notes an interesting object built into the side of the cavity. It is used as in the 3rd attachment to assist the cavity getting into resonance?